Dustin Denkins has fueled his interest in renewable energy into a successful company that makes portable generators. Except he doesn't use fuel. In 2010, Denkins created Suburb Solar, Inc., which he operates out of his solar-powered, off-the-grid home in Cooks, a small town near Manistique. "Really, it kind of formed because of a lifelong passion for renewables," Denkins said. Denkins became interested in renewable energy while he was an MBA student at Michigan Tech University in Houghton. Solar energy particularly intrigued him. "I'd used it many times," Denkins said, "but was always frustrated by how solar power isn't easy." That put a "solar" light bulb in his head. "How can I make solar power easy?" he thought. Using his own personal investment only and applying hands-on, trial-and-error methods, Denkins developed the portable solar generator, which went on the market in 2011. The EasySun 1500 has no moving parts and weighs 120 pounds, balanced over two wheels. "It's portable, unlike gas-powered generators, which are heavy," Denkins said. And while regular generators are noisy, the EasySun 1500 is practically silent, which could make for a more serene camp site in the wilderness. "The happiest customers (of the EasySun 1500) are those with a gas generator already," Denkins said. "They're tired of fumes. They're tired of hauling gas every day." All the user has to do is push a start button, then plug in the appliance. Compare that with a gas-powered generator, which can involve moving a fuel cap vent lever, a choke lever and a starter grip. 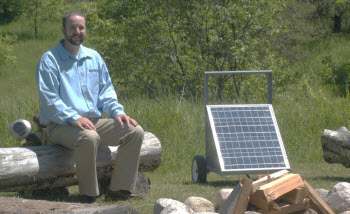 "The portable solar generator that they have developed is a useful item that has many applications in situations where some electrical power is needed and it is not possible or inconvenient to connect to the normal power grid," said Jack Gumaer, assistant professor of engineering technology at Northern Michigan University, who teaches in the field of alternative energy. Rick Ross is an intern with Suburb Solar who's studying entrepreneurship and alternative energy at NMU in Marquette. One of his duties is to market the solar generator, which includes taking photographs of the product (and creating the traveling mascot, Sam the Sunshine Bear). "One of our hardest things is, people see these solar panels and they don't know what to do with them," Ross said. However, the EasySun might market itself eventually. Because the generator is powered by the sun, you basically have "free fuel for life," Denkins said. "The beauty of this is no moving parts," Denkins said. "It continues to sit and create electricity as long as we live." The generator's battery stores power, he pointed out, so it can be operated at night when there's no sun. To power larger appliances with larger loads, add-on solar panels can be plugged into ports on the back of the generator. The generator itself also comes in different sizes. "You have options for cabins and recreational campers and boating," he said. Denkins said his biggest customer base consists of people using cabins for weekend trips when power in remote areas is needed. And although Suburb Solar is located in the Upper Peninsula, Denkins said the company is looking elsewhere to build business, including the winter months when business slows in the U.P. "All of North America, really, is our market, and we target California and the Southwest in those months," Denkins said. Michael Larson, manager of the Upper Peninsula office of Michigan Energy Options, which specializes in energy education, said producing a portable solar generator is a "pretty neat idea" for its intended remote use. "I think, basically, anybody who's producing solar products, they have to be applauded for making clean, affordable energy for the common person." Larson said he also liked a made-in-Michigan product coming to market. "If they can make a niche for itself, I think it's very good," he said. Christie Bleck has worked for Michigan newspapers, such as the Lansing State Journal and Niles Daily Star, since the mid-1980s. She is now a freelance writer based in Marquette. This Michigan product sounds ideal for the swarm of campers and hunters who enjoy our state's many resources. Using solar to power up is a trend that is not going away. Every breath that a child takes might be cleaner if we re-structure our power needs around solar and wind energy. Michigan needs to take advantage now to produce solar devices as a cash business to return out state to some measure of balance and prosperity.